Font Creator for Windows XP - an unusual utility designed to work with text fonts. Its main feature is a user-friendly interface, thanks to which you can quickly change styles and carry out large-scale font editing. The program has a large set of graphic tools that will be useful both to designers and typographers. Using the function of character validation, users can automatically eliminate possible errors of the created font, and optimize it for the selected format. The application supports the download of additional tools and text templates. 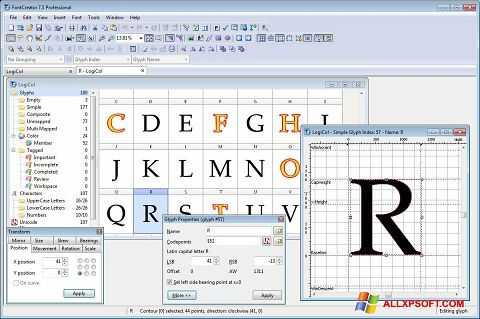 You can free download Font Creator official latest version for Windows XP in English.